Home / Unlabelled / WATCH: Duterte slams De Lima: Wait until I revisit Napoles Case, you will be horrified!Billions of money De lima! 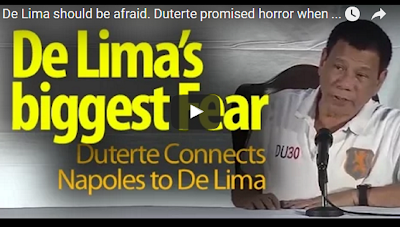 WATCH: Duterte slams De Lima: Wait until I revisit Napoles Case, you will be horrified!Billions of money De lima! This Has to HAPPEN & De-LIMA is the Controller ( De-Lima ) WILL & SHOULD be JAILED for the REST of Her NATURAL LIFE ...Thank YOU & NO LESS is ACCEPTABLE & ( watch out ) " U " are in the Sights of Filippino Reborn.